With less than a month to go until Animal Crossing: New Leaf hits retail stores across North America, Europe and Australia for the 3DS, Nintendo has revealed a host of character profiles on their Facebook page to tease us until the release. Below you’ll find descriptions of a few new arrivals to the franchise such as Labelle and Digby, as well as a few other familiar faces like the friendly historic owl Blathers, who owns the museum, and shoeshine boy Kicks from the Wii’s Animal Crossing: City Folk. Click on the names below to see the official images. If you’re a hat person, you’ll definitely want to meet Labelle. She runs the hats and accessories department of the Able Sisters’ Tailor shop in Animal Crossing: New Leaf. Talk to her if you need the perfect accessory to complete your outfit. Kicks has a new job in Animal Crossing: New Leaf. He was the shoeshine boy in Animal Crossing: City Folk but now he owns his own shop selling socks and shoes. Blathers is back in Animal Crossing: New Leaf and you’ll still find him snoozing at the museum if you visit him during the day. He can evaluate your fossils and accept donations for museum collections. Introducing Celeste in Animal Crossing: New Leaf. Celeste is Blathers’ younger sister and runs the museum gift shop once it opens on the second floor. Meet Digby, Isabelle’s twin brother. He’s in charge of the Happy Home Showcase. He’s ready to help you get connected to all the homes you’ve gathered via StreetPass and SpotPass. Introducing Lyle in Animal Crossing: New Leaf. 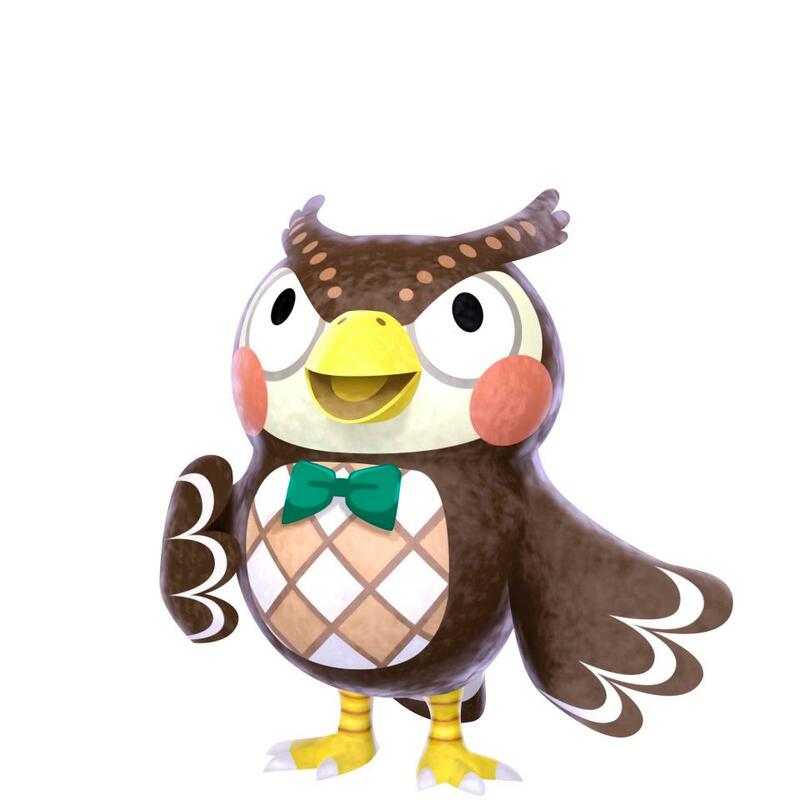 Lyle is the rep of the Happy Home Academy. Go meet him inside Nook’s Homes, and get your home’s interior evaluated. He can also provide you some advice on how to improve your home’s score. This game is cancerous. seriously… its so gay. Grown men actually play this? social rejects. The only social reject here, is you, saying stupid things for attencion, is the only thing you do, go outside and get some friends. Uhh hello! Me and my brother play this game with mother while covering ourselves in butter! It causes an awful amount of clutter as me and my brother sputter all over mothers shutter! Hey now, this game isn’t that bad. My girlfriend and I set each other challenges, it’s just a little fun to past the time till something big comes out (well in my view anyway). Yeah i agree…the game is happy and it makes me smile to play it. That’s why you called it gay right? Because it’s happy. Not my speed, but glad it’s got a lot of popularity for sales’ sake. Not really my kind of game either but it will sell like crazy which will help the 3ds which is ok with me! banjo you are an odd bear. like a real bear would eat kazooie not be her friend!!!!! also you play animal crossing instead of hunt for food. whatever do whatever suits you man. yep conker died, so ME pious took his place. hope you dont die from a heart attack from being so fat. Never played an animal crossing game before… I could get this but what’s so great about these games? I’m more excited for Mario and Luigi Dream Team and Shin Megami Tenesi 4! I’m so excited!!!! I have it on pre-order for the day it comes out! “I like to singa about the moon and…” oh for. Does anyone remember that annoying singing owl family from the Merry Melodies, Looney Tunes era! God I wish I could have that character in duck hunt and shot him with a rocket launcher everytime he started to jive! It’s a shame you don’t have a donate butotn! I’d without a doubt donate to this fantastic blog! I suppose for now i’ll settle for bookmarking and adding your RSS feed to my Google account. I look forward to new updates and will talk about this site with my Facebook group. Chat soon! James was recording Megaman from the NES on vcr long brefoe the days of the Snes, so that renders your point invalid, he clearly knew how to do it. He even explained this in an older video where he used a video camera, 2 vcrs, and a cassette player to edit/add music to his home movies often recording straight from the tv.However, you are right that there is rampant fanboy-ism on this site. I like some of the things he posts and others I don’t. But I don’t let the blind fanboys bother me. You should’t either.It is a little silly of you to use such strong wording on the guy’s own website and not expect fans to flame you. It is provoking for the point of provoking, and that, my friend is the definition of a troll.This is the world of the internets that we live in. You know the rules; If you like something, you are a fanboy. If you don’t then you are a troll. There is no middle ground.